Tiny Delaware is home to one sizable–but shrinking–Amish settlement. Founded nearly 100 years ago, the community just outside state capital Dover faces land pressures, with many families moving away in recent years. However, well over 1,000 Amish still live in the Dover settlement. Amish first settled in the middle of Kent County, the central county of the state’s three, in 1915. Settlers arrived here from states as diverse as Wisconsin, Montana, Alabama, and Ohio. Today, the community numbers 9 church districts, approximately 1200-1500 people. 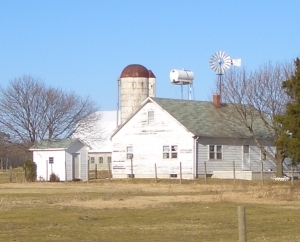 The Dover community is one of a few truly “East Coast” communities, along with Lancaster County, the St. Mary’s County, Maryland Amish community, and a few others. In fact–leaving out the atypical Pinecraft, Florida Amish community–the Dover group may be the most “coastal” of all, in the sense that they are within feasible buggying distance of the ocean. At the Dover settlement, traditional plain white shutterless homes mix with suburban and rural English dwellings. Numerous buggy signs alert drivers to the presence of the Amish, cautioning vehicles to maintain low speeds when passing buggies. The Amish at Dover are also close to another landmark of importance–the state capital. With suburban growth, the Amish community has found itself interspersed with large neighborhoods. Fields of McMansions stand where corn once did, and a number of golf courses are found in the area. With the rise of settlement by non-Amish, road traffic inevitably increases as well. The Dover Amish have begun to leave the settlement in large numbers due to these pressures–with some no doubt enticed by the high land prices. Indeed, a family can sell its farmland and comfortably purchase one, two or even more farms in less-densely populated regions of the country. Numerous Amish from Dover have migrated and started daughter settlements. An example of such community is the Halifax County, Virginia Amish group. Realtor’s signs in some Amish yards as well as formerly Amish homes now wired for electricity are signs of the changes taking place in the settlement. As a result of the land situation, few Amish at Dover remain in full-time agriculture. The price of land in the area generally prohibits young men starting up in full-fledged dairy farming. High land prices may make some question why they continue to farm themselves. In fact, a number of those still owning large farms rent the land to be farmed by English farmers. A local Amish person estimates that only around 20 full-time Amish farmers remain. While farming has dwindled, Amish have opened numerous businesses, consistent with the general trend in Amish society. At the Dover settlement, Amish are involved in a number of trades, including furniture, buggy-making, blacksmithing, greenhouses, sawmills, and a number of shops including dry goods, quilts, and appliance stores. 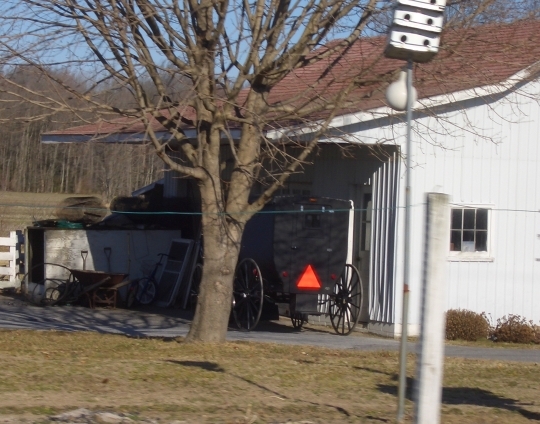 Shops are typically located on-site at Amish homes, with roadside signs advertising their presence. As with all Amish, Dover businesses are closed on Sundays. 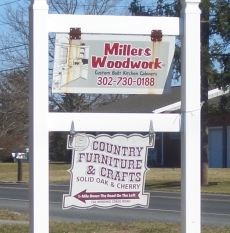 Read more about Delaware Amish furniture businesses. The buggies driven by the Amish in Delaware are of particular interest due to their unique style. Dover buggies feature rounded sides, fully-opening back doors, and a generally bulky size. Some have likened their appearance to that of hearses. The distinctive look is seen only in the Dover community and other Delaware Amish spin-off settlements. Will the Dover community survive? Amish settlements–even sizable ones–have gone extinct in the past. Despite its still-significant size, it’s possible that one day the Dover settlement will cease to exist. In any case, Delaware, given its small size and relatively high land prices, is not very likely to attract much additional Amish settlement. The general trend of Amish migration has been northward and westward, unlike in the early 1900s when more of the country was up for agricultural development and the first Amish settlers arrived in Delaware from diverse states in the West. Odds are that the population at Dover will remain stagnant or continue to dwindle. At best the community may return to a slow growth, particularly if it focuses future settlement westward, opposite from the expanding capital. For a more in-depth look at this community, try the Dover, Delaware Amish settlement report. I think as the economy worsens it is going to become difficult to relocate any distance when you want to, whether you be Amish or not. 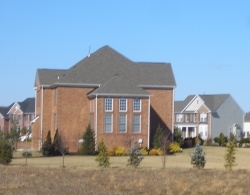 Perhaps their best chance in relocating is now when the land prices are so high in Delaware, but truthfully, the dollar just does not buy much these days. I am an Amish driver in Delaware and they have 10 church districts. I have 3 trees that I would like cut down on my property. They are one gum tree and 2 maple trees. In exchange for cutting them down, you can have the wood. Please let me know if you are interested. My name is John Iplenski from Hartly DE but now reside in Dover. I used to purchase fresh whole milk from a farm on rt44 in Hartly but cannot remember the address or know if they still sell fresh milk. Can anyone help or possibly redder me to another source? I love the work the Amish do, and I’m looking for someone to build me a patio in the Smyrna area. Please contact me, and keep up the good work!!! Hi I am curious. I have worked with the Amish community in Lancaster county pa for the last 10 years with patient advocacy. I helped many patients receive maintenance medications through pharmaceutical companies to help then with the costs since they do not have insurance. My dad is an Amish family doctor in Oxford PA that is how I started doing this. The companies offer insulin, inhalers, armour thyroid, chemotherapy oral drugs, and many many more.